The words eutectic solder describe a solder alloy that melts and freezes at one single temperature. A good example of this is Tin 63% / Lead 37% solder which melts and freezes at 183 °C. This melting point is much lower than the melting points of either pure metal which are 232 °C (tin) and 327 °C (lead). 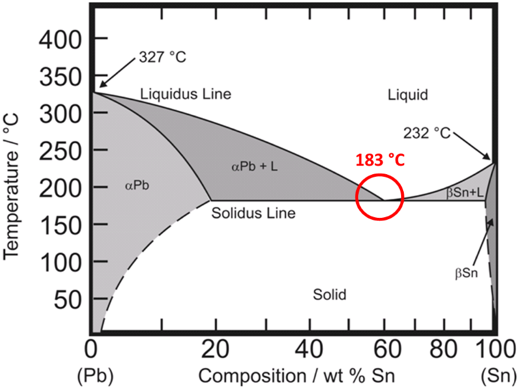 The phase diagram for tin and lead is shown below. If the concentration of tin and lead is shifted away from Sn63/Pb37 then the melting point becomes a melting range. For example, Sn 60% / Pb 40% melts in the range of 183 to 191 °C. As this alloy is heated it starts to melt at 183 °C, is slushy between 183 °C and 191 °C, and becomes fully liquid at 191 °C. Eutectic solders tend to have a bright, shiny appearance while non-eutectic solders tend to have a dull, grainy appearance. Eutectic tin-lead solder was the most popular type of solder used in electronic devices for many years. It melts at a temperature lower than the components being joined together. Tin/lead solder is corrosion resistant and has good electrical properties. It also creates solder joints with mechanical strength suitable for electronic devices. Lead-free solders used to replace tin-lead solder ideally have the same properties as tin-lead solder. Most lead-free solders are tin based and contain silver, copper, and other additives. The elements alloyed into lead-free solders help to modify the properties of pure tin to become more favorable for electronic applications. There are a variety of common solder alloys used for electronics assembly, but only a few are eutectic solders as shown in the table below. Eutectic solders tend to have a bright and shiny appearance as compared to non-eutectic solders. The physical and mechanical properties are also different for each solder alloy. FCT Assembly sells a wide variety of solder products including eutectic solders in bar, wire and solder paste forms. Please contact us for more information.